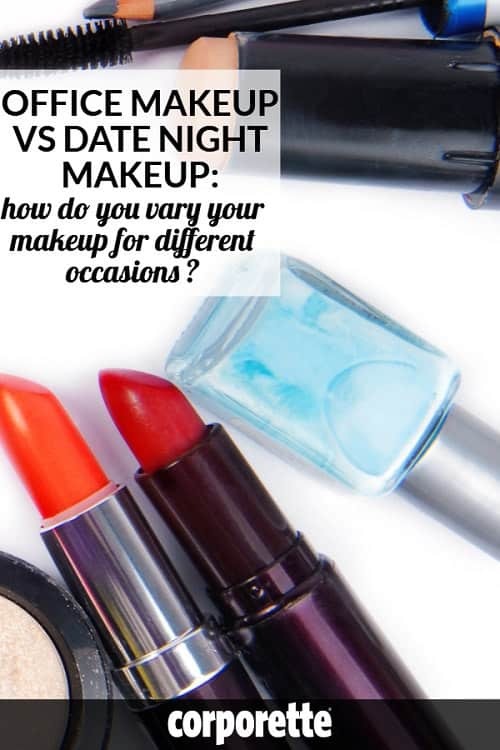 I was going out somewhere recently, and I overshot the mark on makeup — I wanted to do more than my daily makeup look, but less than my evening/date night/party look, and landed up far too close to my “party look.” So I got curious, and thought it might be a fun discussion for today: how much do you vary your makeup for different occasions — and how much do you vary your looks within those situations? For example, do you always have the exact same office makeup look, or do you mix it up with different products and colors? How wide is your range with makeup — for example, from “no makeup for errands” to “four eyeshadows and three mascaras for date night”? For my $.02, I have a pretty wide spectrum of makeup looks for different occasions — possibly too wide! Daily makeup/office makeup: As I’ve written before, makeup for work for me generally means concealer, eyebrow, eyeliner, one color of eyeshadow, mascara, blush, lip liner, lipstick. I tend to have set makeup combinations of eyeliner/eyeshadow/lipstick (so I wear taupe lipstick with greige eyeshadows, but pink lipstick with taupe eyeshadows, for example), but always the same general products applied in the same general way and no more than two or three looks. Date night / party makeup: This is where I deviate from what is, in general, a fairly natural look — I like a smoky eye, what can I say? I usually do foundation, concealer, contouring/highlighting/blush, eyeshadow primer, 2-4 eyeshadows (generally all in the same color family), dark eyeliner on top (usually with an added swoop of dark black or dark navy shadow on top of the liner to set it), light eyeliner below my eye (taupey/fawn usually but maybe a faded gray/navy if I’m feeling like it) and usually a pretty neutral lip that somehow takes extra long to apply. I may do a mascara primer as well as mascara (sometimes even layers of different mascaras! ), or I may do my One Two Cosmetics lashes. Sometimes I give my husband a choice for the general shadow look (“honey, pick brown, black, purple, or blue”) — sometimes I give my 7-year-old son the choice. I have fun with the date night/party makeup and it’s fun to see myself all dolled up — but it’s a TON more makeup than I normally wear and I worry it’s jarring to people who may, say, only know me a “no makeup/glasses” situation. I also keep collecting red lipsticks in the hope that one day I can get a great red lip with a more natural-but-polished eye look — but I have yet to find a comfortable lip that I can wear for hours without constant monitoring or regret — so I’m not there yet. So let’s hear it, readers — what are your thoughts on different makeup looks for different occasions? What are your regular looks for office makeup, interview makeup, date night makeup, weekend makeup and other situations? Do you have several makeup looks or just one for each situation? If you work from home regularly, do you wear makeup? How has your makeup changed as you got promoted, got married, had kids, or generally gotten older? (Are there any looks that you think are too “young” for older women, short of, say, Jem’s makeup?) If you occasionally wear glasses, how do you vary your makeup? Stock photo: Shutterstock / severija.